The week was about listening and learning from the local community. Gerry Carlile was instrumental in introducing Marie to many of the local businesses that she met and Máirtín Ó Muilleoir organised various visits including a welcome dinner on the final night. It was a busy and productive visit with many highlights. As part of the visit, initial agreements have been made with local businesses that can support the delivery of HALO Belfast. Todd Architects, based in Belfast’s Titanic quarter, are among the first to have been signed up for the project. They have an alliance with Glasgow-based architects, Keppie Design, a key partner, whose team has steered the design of The HALO Kilmarnock. Brian Lavery and his team at CBRE have been signed up as local consultants in Belfast. 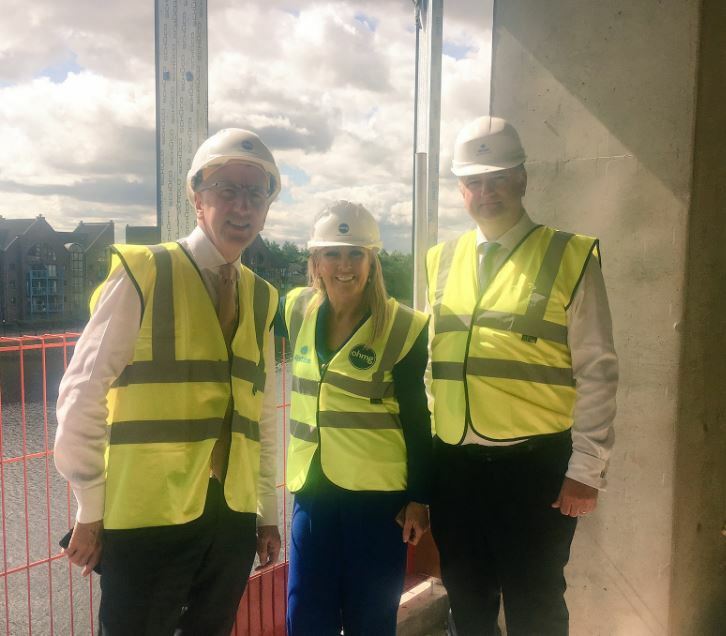 A tour of Allstate Northern Ireland’s new waterside premises with Managing Director, John Healy and Máirtín Ó Muilleoir MLA. Allstate NI provides high quality software development services and business solutions. They are investing £26M into the Belfast community, working in collaboration with Belfast City Council and creating 1,500 high value jobs. Meeting with Dr Norman Apsley OBE, Chief Executive Officer at Catalyst Inc to talk enterprise, tech, cyber and innovation. Catalyst Inc provide connected workspace, networks & support to advance the knowledge economy in Northern Ireland. A visit to East Side Visitor Centre and East Side Arts – a fantastic community project at the heart of the Belfast community. Meeting with Brian Loughran of Radius CF and the team at Keystone Law to talk about economy, investment and property. Learning about education in Belfast from Damian Duffy, Director of Development at Belfast Met, one of the largest colleges in the UK. Meeting with Philip Mills of CSIT (Centre for Secure Information Technologies) to learn about their membership model and collaboration. A visit to the historical Belfast City Council City Hall to talk about regeneration and investment alongside councillors, Jim McVeigh Group Leader of Sinn Fein and Lee Reynolds, DUP group leader. 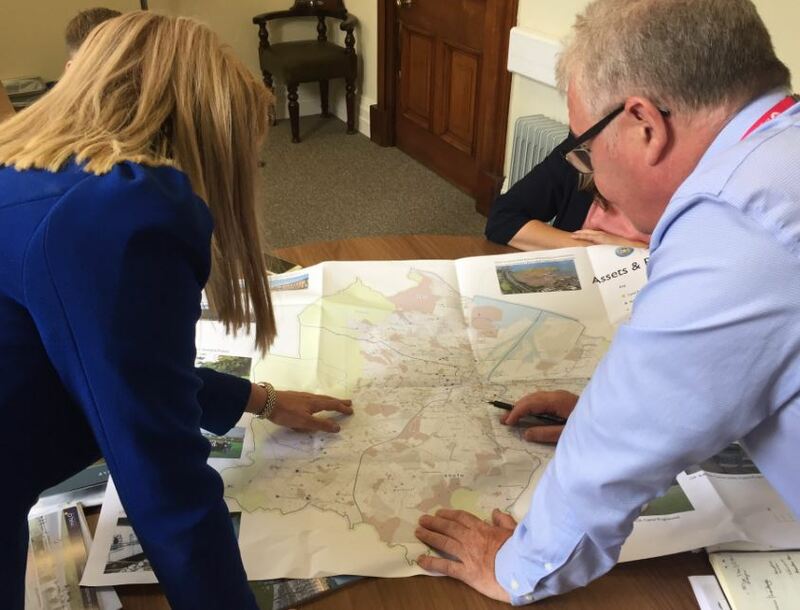 Marie also met with council officials Nuala Gallagher, Director of City Centre Development and Gerry Millar, Director of Property and Projects to discuss regeneration strategy for Belfast. The work of social enterprise, Loaf Catering who are creating beautiful food and meaningful jobs for people with learning disabilities and autism. All profits from the work of Loaf Catering go to NOW Group, a social enterprise supporting people with learning difficulties and autism into jobs with a future. A tour of the beautiful Belfast City Hall including viewing the Dome of Delight where Marie met Martina and Ann Hunter. Part of the project is about being able to communicate to the local communities so Marie met with Belfast Media Group journalist, Brónach Ní Thuama, a business journalist from The Irish News, against the beautiful backdrop of the Harry Clark stained glass window in St Dominic’s Convent and Gareth Mckeown. The week closed with a fantastic dinner hosted by Máirtín Ó Muilleoir at local restaurant, Graffitti. Run by two sisters, therestaurant put on a wonderful menu for the nearly 30 guests who included Belfast City Council Chief Executive, Suzanne Wylie, Young Enterprise Northern Ireland’s Chair, Ciaran Mackel who spoke passionately about the need for young entrepreneurs, David Gavaghan, Chair of CBI, Paddy Nixon, Vice-Chancellor and President of Ulster University and a host of exciting local business representatives. Their passion and positivity for the future of the city of Belfast filled the event and was a fitting end to an excellent week in this vibrant city. Thank you to everyone that Marie met and for the warm welcome she received.